Although the dramatic turnaround in stocks from midnight on election night to lunchtime on Wednesday has been getting all the attention, my team's primary focal point this week has been the movement in the bond market. Don't look now fans, but the yield on the U.S. 10-Year T-Note has surged from 1.828% on election eve to 2.117% yesterday. And in case you don't follow rates closely, this is a pretty big move. Then when you broaden out your view, you will undoubtedly notice that since the beginning of July, yields have made an even bigger move. From July 5 through yesterday, the yield on the 10-year moved from 1.367% to 2.117% - and if my calculator is correct, that's a 55% increase! From an investment committee standpoint, there are three questions that need to be answered. First, why have yields spiked since the election? Next, why have yields been moving up steadily since July? And third, is this the end of the secular bull market in bonds (a bull that has been in place for 35 years)? So, I spent a fair amount of time on the phone yesterday talking to experts in the bond markets and to folks whose view on the economy I trust. While I had my own view on the bond situation, I wanted to make sure I wasn't missing something. Question #1: Why the Sudden Spike in Yields? This one is actually pretty simple. In short, what we're seeing is the "Trump Trade" playing out in the bond market. The expectations are for Trump to cut taxes and embark on an aggressive infrastructure stimulus plan, financed by changes in the tax code and of course, deficit spending. 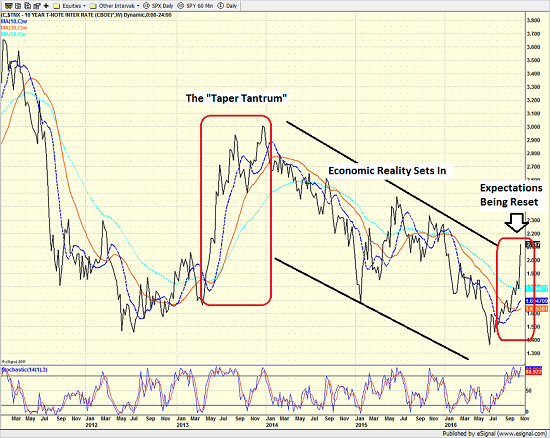 The first point is this will add supply to the bond market, which would cause prices to fall/yields to rise. In addition, it can also be argued that if Trump's policies get implemented - and soon - we could expect to see an increase in both inflation and economic growth. And lest we forget, this is something that the central bankers around the world have been striving for over the last 5 years. 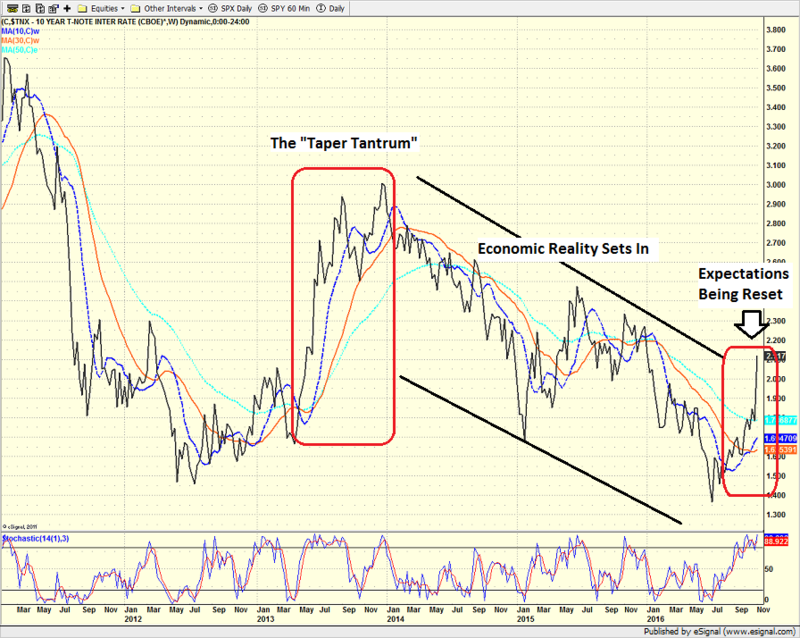 Thus, from my seat, the current spike in yields can be viewed as a "reset" of expectations for the future. Whether the move sticks or not is a question for another day. Question #2: Why the Steady Rise Since July? This one is a little tougher. If you study the daily chart of the 10-year yield below, you will see that there have been three distinct moves since July. Our view is the first move off the emotional low seen on July 5th (a low that had been caused by worries over global growth) was driven by what has affectionately been referred to as a slow motion "tightening tantrum." If you will recall, FOMC members started talking about hiking rates again in response to some improvement in the economic data and inflation expectations. And traders reacted. 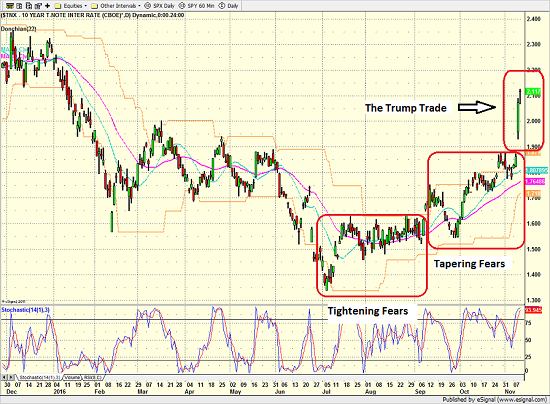 Next was the surge-pullback-rebound pattern seen in September/Early-October. This move is being attributed to a mini "taper tantrum" in response to talk of the ECB starting to pull back on their QE program. The key here is the anticipated collapse of the UK economy post-BREXIT hasn't happened. And while this has been largely more rumor than fact, the steadiness seen in the economies across the pond leads traders to worry that they may need to start adjusting their positions for an ECB "taper." The next, and perhaps most important, question is if we are seeing the beginning of the end of the massive secular bull market in bonds that has been intact since the early 1980's. Question #3: Is This The End? Cutting to the chase, at this time, my answer is, no. Or at least, not yet. To be sure, the secular decline in yields will come to an end at some point. However, logic would suggest that such an event would be tied to (a) strong economic growth both at home and globally and/or (b) a significant increase in inflation. And not the hopes for some economic stimulus that may or may not occur. The bottom line is that the economy is NOT strong at this point. 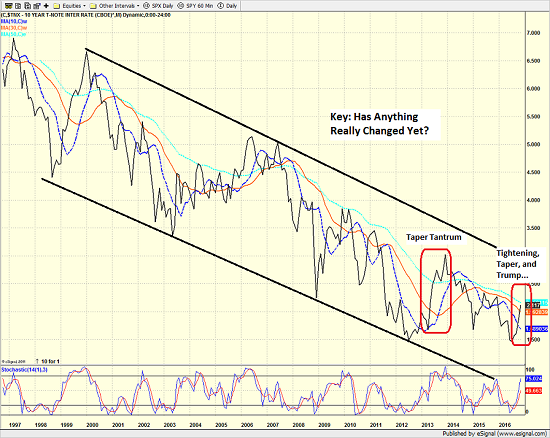 Take a look at the weekly chart of the 10-year below. After traders freaked out in 2013 over the idea that the Fed was planning to "taper" their QE scheme, economic reality set in - and yields fell steadily for the next two and a half years. Thus, my take on the current bounce in yields is that "expectations" for growth, inflation and supply are in the process of being reset. But it is important to remember that once traders feel prices have fallen enough to discount these expectations, economic reality is likely to take over again. In other words, improvements in the economy and an increase in inflation would have to actually happen in order for rates to move significantly higher. So, in looking at the situation from a very long-term perspective (i.e. 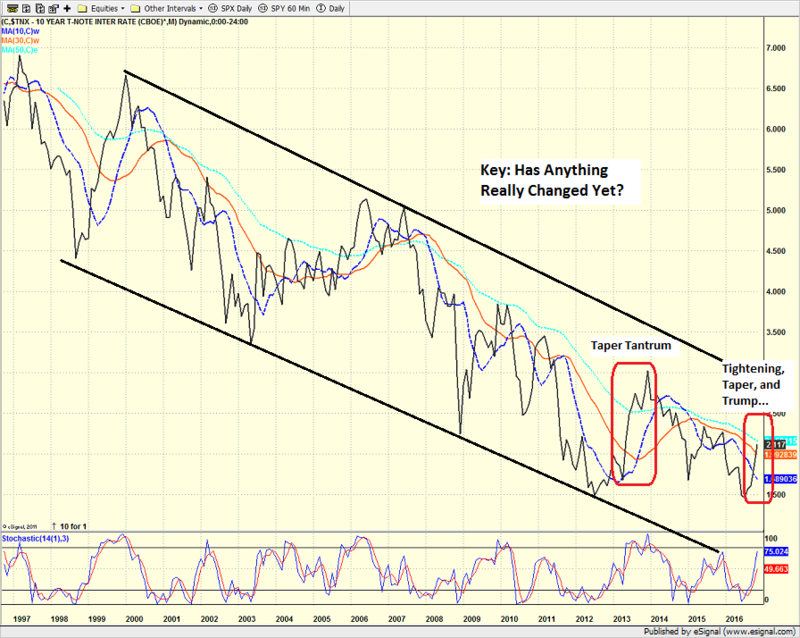 a monthly chart going back 20 years), the question you have to ask yourself is, has anything changed? It can be argued that things can now be "expected" to change - and that these expectations justify an increase in rates. IMO however, unless the yield on the 10-year moves above 3% - and stays there - it would be hard to argue that the fundamentals have moved enough to create a sea change in the bond market. So, for me anyway, the bottom line is we are seeing a near-term readjustment of expectations and that the move is likely in the later innings of the game. But remember, things can change quickly in the markets, and this remains a VERY important situation to monitor. 1. The State of the "Trump Trade"
Looking for a "Modern" approach to Asset Allocation and Portfolio Design?